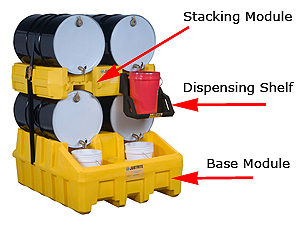 Prevent chemical and hazardous material spills with systems that contain spills as well as provide storage for 55 gallon drums. Select stacking modules, base modules, drum racks with sumps and more. Each product helps keep fluids contained and safe. JSTRT-28668 46"W x 12"D x 49"H 2 Stack Module / Yellow 66 gal. 1500 lbs. JSTRT-28669 46"W x 12"D x 49"H 2 Stack Module / Black 66 gal. 1500 lbs. JSTRT-28666 46"W x 26"D x 49"H 2 Base Module / Yellow 66 gal. 3060 lbs. JSTRT-28667 46"W x 26"D x 49"H 2 Base Module / Black 66 gal. 3060 lbs. JSTRT-28671 18-3/4"W x 16-1/2"D x 19-1/2"H N/A Dispense Shelf / Black N/A 60 lbs. UT-2386 53"W x 29"D x 49-1/2"H 1 Rack - Drain / Yellow 66 gal. 750 lbs. UT-2387 53"W x 29"D x 49-1/2"H 1 Rack - No Drain / Yellow 66 gal. 750 lbs. UT-2383 53"W x 53"D x 44-3/4"H 2 Rack - Drain / Yellow 66 gal. 1500 lbs. UT-2384 53"W x 53"D x 44-3/4"H 2 Rack - No Drain / Yellow 66 gal. 1500 lbs. UT-2380 53"W x 53"D x 77-3/4"H 4 Rack - Drain / Yellow 66 gal. 3000 lbs. UT-2381 53"W x 53"D x 77-3/4"H 4 Rack - No Drain / Yellow 66 gal. 3000 lbs.